A team of researchers have gathered at Stanford's SLAC National Accelerator Lab this week in a high-tech treasure hunt. Their quarry is a hidden text — a 6th century medical manuscript holding the writings of Galen, the Greek physician whose teachings dominated the practice of medicine for more than a millennium. Sometime in the 11th century the original writing was scraped off the parchment and overwritten. The newer writing, holding psalms for days of the week, is primarily what can be seen with the naked eye. But the original writing isn't necessarily gone. Some traces of ink may linger behind, waiting to be revealed by the Stanford Synchrotron Radiation Lightsource. At SSRL researchers study use high-intensity X-rays to study everything from fossils to batteries to large bio-molecules. "That's why we're here at the synchrotron because the X-rays can pass through the ink and the parchment without any trouble at all," says William Sellers, a scientist specializing in large data from the University of Manchester. Sellers is able to take the data from the scans and shape it so scholars can read the underlying text. Fortunately, the old ink and the new ink respond to X-rays in slightly different ways, using a technique known as X-ray fluorescence imaging. "What my software has to do is spot effectively these different colors that come off and we can use that to split apart different text layers." Working around the clock, the team, aided by staff from the Lightsource, has already uncovered a completely new piece of writing. 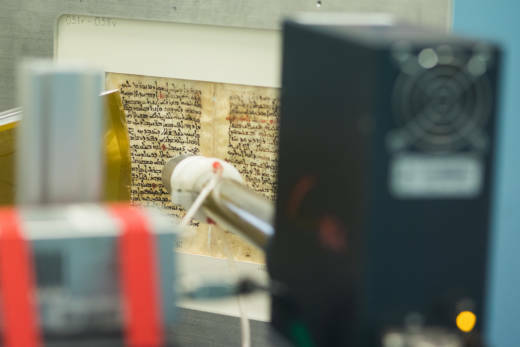 "We're very excited because we've identified one of the last missing leaves [of the document]," says Professor of Classics and Greco-Arabic Studies, Peter E. Pormann, also from the University of Manchester. Through these scans they've found a preface written by the translator who took the writings from Greek and rendered them in Syriac, a form of Aramaic. "We have to do more deciphering, but the initial results are mind blowing." The team is racing to uncover what it can before the week is out. After that, a new research team will come in, using SLAC's advanced hardware to seek answers to other mysteries.